The Filming of "The Testament of One Fold and One Shepherd"
Filming of "The Testaments", note 65mm camera on crane in back ground. Image courtesy T C Christensen. Filming events that occurred thousands of years ago is challenging. Add elements considered metaphysical or supernatural and the difficulties mount. And when those events are also viewed as sacred, the obstacles might be viewed as insurmountable. But it was a challenge undertaken in Academy Award-winning Writer/Director Kieth Merrill's latest project. "Testaments" is a 66-minute, 70mm dramatic film produced by The Church of Jesus Christ of Latter-day Saints for wide-screen projection in the Legacy Theater in Salt Lake City, Utah. Among the many difficulties such an ambitious project involves, a number are distinctly visual and of special concern to the Director of Photography. That role was filled on this project by T.C. Christensen, whose credits include several feature films, over a hundred television commercials and 8 large format films, encompassing 5, 8 and 15 perf. (IMAX) productions. The director called for many scenes set in the Old World to be photographed on stage, including day exteriors, so that the light could be closely controlled and a mood created that would be difficult or impossible to duplicate when dealing with the outdoors. According to T.C., the concern then becomes creating those exteriors and "not having them look like a cheap, hokey, poorly lighted interior." Our stages were not especially large and at times we had several sets on them at once, so it was difficult creating that single source look that you would have outside and not creating a bunch of multiple shadows, which gives it away quickly that what you're seeing is not an exterior but is actually an interior set." This film depicts events from the life and ministry of Jesus Christ as recorded in the New Testament and the Book of Mormon. The story culminates with a portrayal of the resurrected Savior's visit to the ancient Americas as seen through the eyes of a fictional family. "The Testaments of One Fold and One Shepherd" is a compelling and inspiring large-screen movie presentation depicting the events leading up to Christ's appearance in the Americas, including scenes from His ministry in the Holy Land. "One way we attempted to solve the problem," according to Christensen, "was to hang space lights around the set. Our units contained six doubled-ended 1K bulbs in a cylindrical configuration with a silk material draped around them. We used these to provide overall ambience. The bulbs could be powered in three separate circuits, so we could burn two, four, or six bulbs at once, depending on the level of light required. In some situations, we removed a bulb so we could use the fixture with just a single 1K bulb. Then we would come in with a big unit and create one direction to the light while being extremely careful to only let one shadow show on the ground. Other Holy Land exteriors were shot on location near Palm Springs, California. One scene involved a tracking shot of Mary riding toward Bethlehem on a donkey. The script called for her to look up toward sunbeams pouring through palm trees and seeing the sunlight dance on her face. "We couldn't count on the sun staying at the correct angle through the palms for long. It would change with every take and we'd spend all our time chasing it." So the shot was set up so that Mary was back lit by the sun, with an artificial sun at a consistent angle created for the key light. "It was trial and error to achieve the effect of light and shadow we wanted," he says. 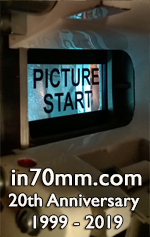 "We tried a 12K HMI with a fresnel lens, mounted on a condor. We put palm fronds and camouflage netting between the lamp and the actress, but the shadows weren't sharp enough. So we replaced the HMI with a four-by-four-foot mirror to reflect the sun itself. This gave us the right quality of light," Christensen says, "the shadows created by the nets and the fronds were sharper now but still didn't feel right." The right look was finally achieved with the help of gaffer Dennis Peterson, who rode along on the dolly dangling palm fronds in the light, moving them slightly to add to the shifting shadows. The lens for the scene was a 60mm at T/11; with the talent only 4 feet from the film plane - the stock, Kodak's 5246. This film is shown Monday through Saturday at 10:30 A.M., 12:00 noon, 1:30 P.M., 3:00 P.M., 4:30 P.M., 6:00 P.M., 7:30 P.M. in the North Visitors' Center on Temple Square. Admission is free. All the stock for the show was by Kodak. 5246 and 5274 were utilized for Daylight Interiors and exteriors. Kodak had just released the 800T high-speed negative in 35mm, so Christensen tested it against 5279, hoping for the greater depth of field the extra 2/3 stop would provide. "I had done other large format shows where we pushed the '79 a stop. My tests showed that other than a slight increase in grain, the 5289 was comparable to 5279. So I opted to shoot some '89 but to also do some scenes with the '79 pushed." Tim Knapp at Kodak was able to get 40 rolls of the new stock produced in 65mm format in time for the shoot which was February of 1999. "I was a little unsure of the '89 and mostly went with the '79 pushed one for our night interiors. Now, that I've seen it printed and projected on the huge screen, I wish I would have shot more of the 89 and less of the '79 pushed. There is an almost imperceptible increase in grain and loss of sharpness with the '89 over the normal processed 5279, but with 5279 pushed one stop, the blacks were milkier," according to Christensen. "We shot a whole sequence in a cave seemingly lit only with torches and we tried to be sketchy with the light, so there was always lots of black in the frame. Even by including a flaming torch in every shot to provide contrast and snap, and only rating the '79 push one at ISO 800, (as opposed to Kodak's recommended 1000) the blacks are not as rich and deep as I would like them to be." The production was shot with two Arriflex 765's, with a Panavision HSHR on hand for Steadicam and hand-held work. Merrill and Christensen often rely on over-cranking for dramatic effect. In "Testaments" camera speeds ranged as high as 100 frames per second. Most of the footage for "Testaments" was exposed on location in Hawaii. 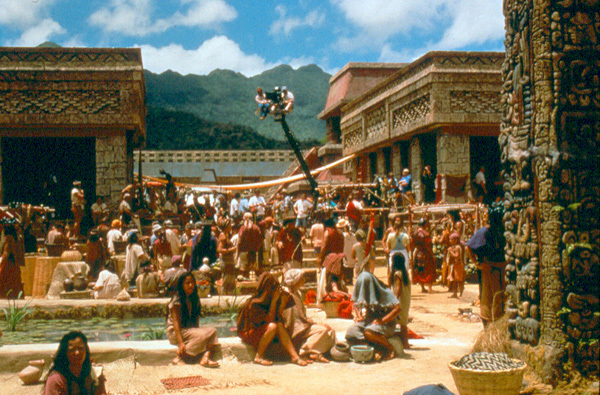 Here, scenes taking place in the New World were filmed. Shooting in Kauai presented its own set of challenges. "We were shooting mostly daytime exteriors," Christensen says. "At that latitude, in the month of April, the sun seems to rise from nowhere to the middle of the sky instantly, then, at the end of the day drop immediately back into the ocean. There's no magic hour, you're lucky if you get a magic minute. So we were always fighting that harsh top light." Clouds presented another kind of difficulty. They streamed across the sky with the prevailing winds that are always flowing across Kauai. "Most times it worked out great," Christensen says. "If I preferred a cloudy look for a scene, we'd just wait a minute and a cloud would move in. If I wanted sun, it wasn't usually much of a wait to get sun. It was kind of like having a big movable silk in the sky. The problem was when a scene ran more than a minute or two and we'd end up having to cut because of the light change. We were originally planning on quite a few digital or optical matte shots for the film. As the budget got tighter, we started losing them. Kieth had a great idea how to do some of the crucifixion scenes on stage, in camera. We had the scenic artist paint a 15 x 30 ft. backdrop of stormy, gray clouds. The drop was then stretched on a pipe frame and hung on 2 ropes from the roof of the stage. While we filmed the Savior on the cross, the grips would slowly move the drop through the frame as if the stormy clouds were passing through. It worked perfectly. A great low tech / low budget solution to a high tech need. Night scenes were also called for in the script, including some featuring the aforementioned cataclysm. "We shot this on the '79 stock, usually pushed one stop," says Christensen. "We used HMIs with 1/4 CTO for moonlight, and tungsten lamps with 1/4 CTO for firelight. Then we'd shoot the color chart with a 1/4 blue, which would push all the color 1/4 warmer." This allowed us to keep a slightly deeper stop which in this format is always needed since there is so little depth of field. All in all, Christensen is pleased with the look of the film. "Like anything I shoot, there are things that will drive me crazy every time I see the film. But this large format is, in many ways, very forgiving," says Christensen. "When projected on a screen 60 feet wide, it's so overwhelming and involving that you are swept away by the majesty of it all and to most viewers, I hope my stupid mistakes fade into insignificance." Our production designers, Richard Jameson and John Ubel designed the largest set ever built on Kauai, it was 600 ft. long and 175 ft. wide. The amount of detail in our shots with this set in foreground and the Kauai mountains in the background is incredible because of the huge negative coupled with the great Production Design. Given the nature of the events depicted and the characters involved, it should be no surprise that there were tender and touching times. The most emotive, for Christensen, occurred when the resurrected Jesus Christ walked among believers. "We were shooting Steadicam close-ups of His hands as He walked down the steps of a temple. One of the extras, a woman, reached out and touched one of His hands, then impulsively leaned forward and, with tears in her eyes, kissed the hand. "The tears were real," Christensen says, "and continued for several minutes after the scene was cut as did the tears of many actors, extras and crew. It was a moment that exemplified the privilege of working on a Bible oriented film that had all the elements of good film making and the added bonus of a spirituality pervading the set. It made working on the film a great experience. The goal of the film makers is that the accompanying 24-track soundtrack, and the emotional power of "Testaments" will bring millions to see it in the years ahead.